Nestled amidst lush forest is the Wat Pha Lat Buddhist temple which is absolutely serene and not frequented by a lot of travellers as not many know about it. The temple sits rights next to a waterfall and hides under the canopy of trees and the path that leads up to the temple is beautiful. The temple is exceptionally impressive and there you would find of sculptures of Buddha which seem to be at least a thousand years old. 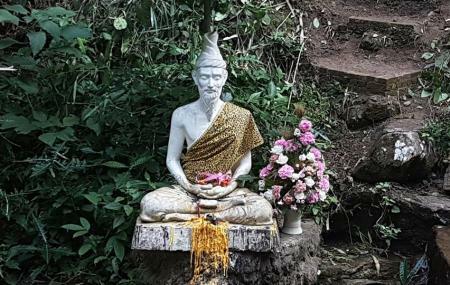 Wat Pha Lat was once used as a resting place for people who died on the pilgrimage up in the mountains to worship Doi Suthep and later developed into a monk residence and a serene place to meditate. How popular is Wat Pha Lat? People normally club together Wat Phra That Doi Suthep and Night Bazaar while planning their visit to Wat Pha Lat. Peaceful. Quite. Natural. The most ancient thing in the temple according to the abbot is only tangible when you close your eyes and wait for a few minutes. I did get it.It's true. Tips: Sit down at the Main Hall, the one with a big Buddha statue and walless at three sides. April 2019. 5 stars because rare style and very jungle atmosphere. All stones, like an old Indiana Jones movie with a lost temple you just discovered. Very quite and peaceful place surrounding by nature. This place is different from most of temples in Chiang Mai or even in Bangkok. It’s definitely worth visiting especially if you would like to practice meditation. Highly recommended. Great place for people looking to avoid the hoards of tourists at a tranquil temple in nature. Unwind, meditate, breathe, soak in the nature, and forget about time for a bit. Definitely a bit of a hidden gem. Tranquility. Temple on a waterfall. Took an hour’s hike from the trail. Relatively simple forest track with a clear pathway. Get the taxi to drop you off of the CHIANGMAI zoo entrance. Follow the orange ribbons up.